1. When there is so much filler that people are distracted from listening to content. I’ve seen sidetracked audience members flippantly make hash marks on their notepads as the speaker continues to “um, uh” his way through nearly every sentence in his presentation. 3. When the type of filler distorts the message. “Kinda” and “Sort of” are minimizing phrases that weaken whatever follows. “Probably” and “hopefully” suggest the outcome is in question, something that makes senior-level listeners wonder about the confidence of the speaker. Sentences like this one do not elevate presence: “So hopefully we’re gonna be able to give people an overview of that, and it will kinda make sense to everyone.” Would that make you feel confident if you were the listener? A = Awareness. Most people have no idea that they have the filler habit. You can’t fix what you don’t know. Get specific feedback from trusted colleagues or family members so you know what to tackle. B = Breathe. Filler increases when people speak too quickly and don’t pause at the end of their sentences to take a breath and prepare their brains for the next sentence. Slow down, pause and breathe at the end of every sentence, and don’t talk until you’re ready. Embrace those milliseconds of silence so you and your audience have a chance to think. C = Catch Yourself. Consider using your smartphone’s voice memo app to record yourself for 10-15 minutes each day and then listen to it on your commute, noticing the amount and type of filler. This will also help increase your awareness. Coaching clients of mine who’ve recorded themselves 2 times a week dramatically decreased their daily use of filler in as few as 4 weeks. Note: We recommending recording only your own side of a phone call so you don’t invade anyone else’s privacy. Wow, these tips are, like, sort of effective. They could work, right? You should, you know, try it. Probably. Right? Just kidding!! 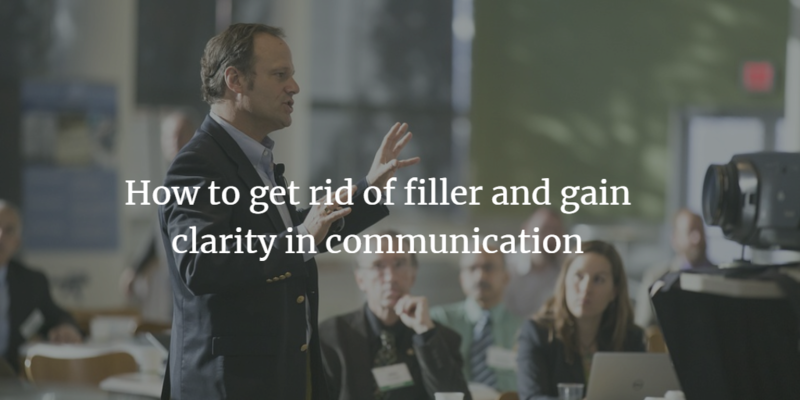 These tips will most definitely help you increase clarity and credibility by eliminating filler. Let me know how you make out.